Apollo 2013 graduated last Friday (July 5th). Congrats to everyone and many thanks to all of you who supported us! And here comes the new Vlerick website! After some time and the release of the new visual identity, here comes the new Vlerick website! The address did not change: https://www.vlerick.com/ but the content does. Here is an example of what it currently displays (with Prof. Van den Broeck from Beyonders as first guest star (well another guest star is Sharon Dhadialla from FTMBA2012 in the top banner :-))). 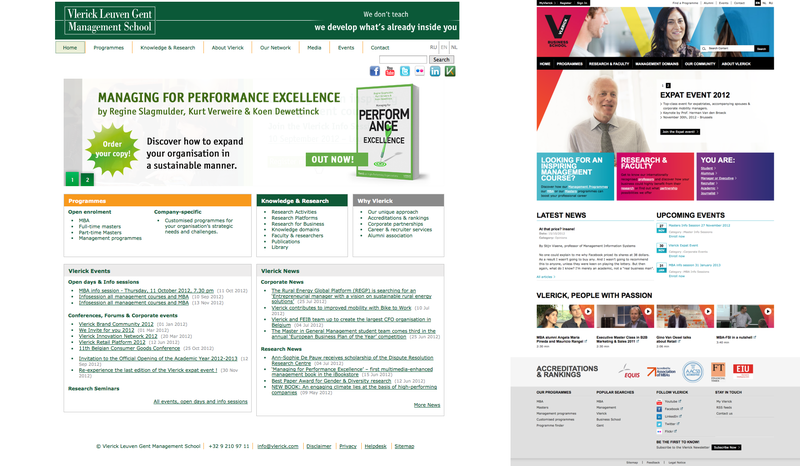 Note that all links to the Vlerick website in my previous posts are now broken but I will not fix them: when you call a page that does not exist, you’ll find a nice error page with a search bar and the plan of the website. First it is impossible to quickly get the full agenda. Section “Upcoming events” just contains the three next ones. For your information, the full agenda is here. Then the classic links to social websites are there. 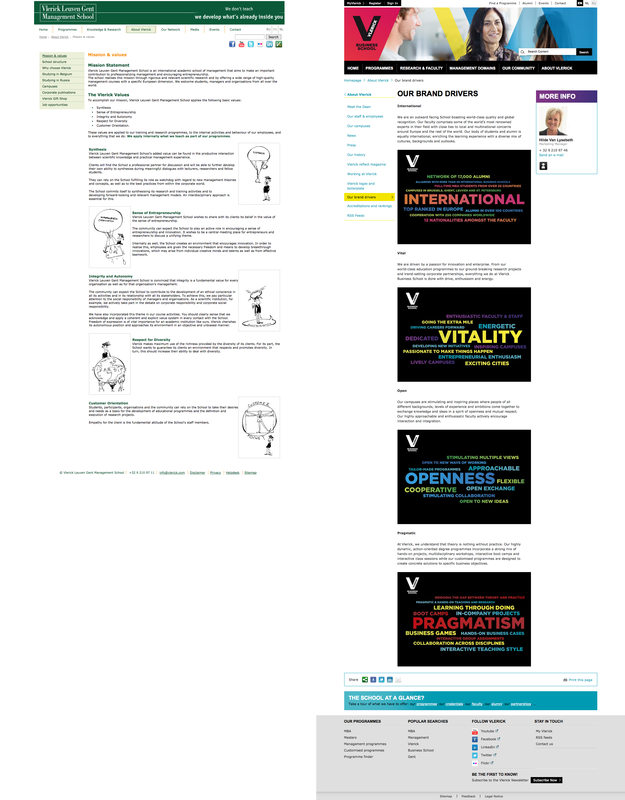 I was waiting for them :-) Each bottom of page also contains some links to share on Twitter, Facebook, LinkedIn, etc. The only drawback is that there is no hint when the mouse hover over these small icons. “f” or the Twitter bird are quite obvious (for someone who use these services). However what does the kind of white nunchaku on green background mean? (answer: even more sharing possibilities, with text legends this time). Finally the website does not adapt gracefully to mobile devices. It’s just the same version, zoomed out. In a nutshell: no mobile version. Note however that http://m.vlerick.com/ does in fact respond (a 403 error but might still be the sign of something being prepared). The previous motto (“we don’t teach – we develop what’s already inside you”) disappeared. Instead we have a “Brand Drivers” page (which is very different than “Mission and Values” that the URL suggest as Prof. Verweire of Strategy told us). There we learn that the new drivers of the school are: International (first! FT ranking officers, please notice this! ), Vital, Open and Pragmatic (you draw your own conclusion when you compare with the previous values: synthesis, sense of entrepreneurship, integrity and autonomy, respect for diversity and customer orientation). The content of pages is approximately what you expect to read from a school website. One nice thing however is that most pages have some kind of “owner”: a person responsible or at least who you can contact in order to get more information about the content of the page. There is a picture of the person. But what is even more interesting is that all means of communication are presented, if available. For instance Prof. Herman Van den Broek has links to his research page, his blog (well, in this case: the HR blog) and his twitter account (the last tweets are even displayed). 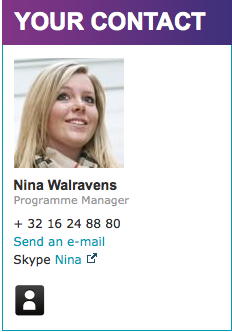 Those who have a (corporate) Skype account will also have this link (like our dear Nina – user ID ninawalravens_vlerick – on the Executive MBA programme page). Idem for LinkedIn (more common than any other social presence, btw). The library page is still there. The default page from http://www.vlerick.com/library is in Dutch (which seems logical – until you come from a page written in English, it might be surprising). On that page you will also switch back to the old, green favicon (the green V being the logo of the webpage) ; another page lost in transition? ;-) Of course the list of e-resources (like EBSCO) is still there. It struck me that 5 out of 9 links to Business and Management Literature are to Open Access resources. It might be interesting to hear more about how the school see this Open Access movement fit into their business and businesses in general. 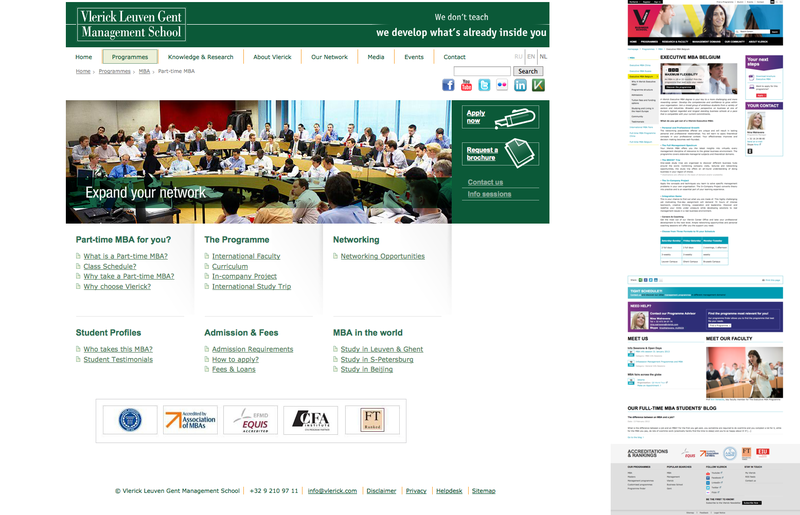 I was also eager to see the official presentation of the new Executive MBA on the website. Here it is. Again a long vertical content :-) to present the “Matrix”. I don’t know if they will keep the Apollo name but the Leuven campus will only see week-end PTMBA. On the other hand Brussels will now welcome students on Monday + Tuesday. Will the content change? It’s difficult to say: labels of courses changed but how to know the content? In the old website we had a short description of each course (which was helpful to understand what were the topics that will be seen when preparing admission tests – ymmv). For instance I guess “Using & Interpreting Data” is the new “Fundamentals of Business Statistics”, “Corporate Responsibility & Sustainability” the new “Corporate Responsibility and Business Ethics” or “Understanding the Economic Context” the new “Economics”. 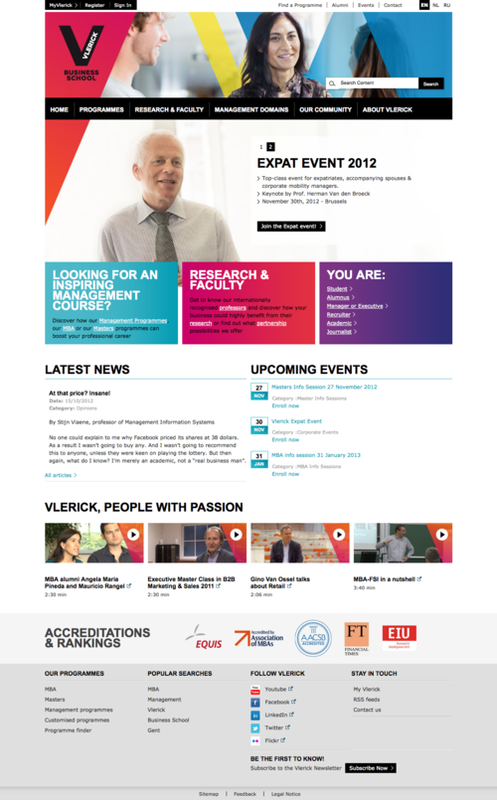 And last but not least: does the new website – with all these social web features – made blogging more popular at Vlerick? Unfortunately I don’t think so. You still have the outdated Dean’s blog (ok, there is an official letter announcing the new brand in 2012 but I don’t consider 1 post in 2 years exactly as “up-to-date”). You still have the active Masters’ blog and the SEC blog for instance. But I couldn’t find the general page redirecting to all blogs. But of course you should not dictate how staff should use web 2.0! 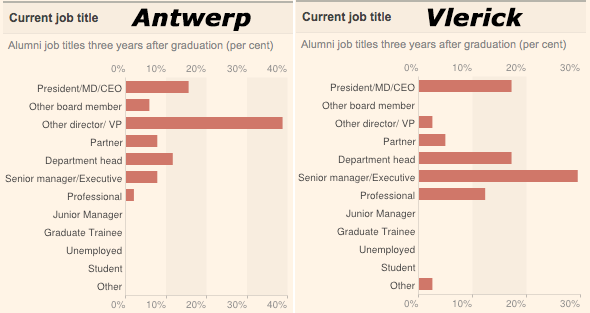 Vlerick EMBA program now only 90th in the FT rankings – should I worry? Ranking Vlerick B.S. Antwerp M.S. Solvay B.S.E.M. IAG-L.S.M. There is a limited number of rows because I was focused on Belgian business schools that are not in the WSJ ranking nor in the BusinessWeek ranking for instance. Thus Vlerick is in three types of configuration: either ranked alone (we don’t know how the other would behave), either in first position (EU ranking 2011), either in second position. Why can’t Vlerick be first everywhere? (and also I’m only comparing Belgian business school). Before going into the details of what components are in the EMBA ranking of 2012, there is something that is worrying: whatever business school, whatever ranking, all Belgian business schools are going down! How come? I thought that more and more students were chosing European business schools, mostly because they seem more prepare to face the economic crisis and cheaper (this does not necessarily mean of better quality I agree). So clearly we see the AMS is recruing people declaring a much higher salary (entrance fee is approximately the same) and declaring a very good career progress after the EMBA. AMS classes has nearly the double of women than VBS. And where the VBS makes a good difference with AMS, the FT doesn’t give that much weight to it (e.g. women on board, international board, etc.). So – back to the title – should I worry?